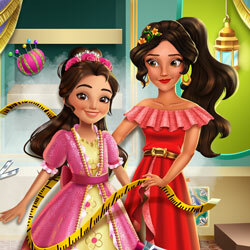 Description: There's a ball coming up and your favorite Latina Princess wants to use her workshop to make her little sister a beautiful new outfit! But oh my, she hasn't been to the room in a long time, and it's a mess! Will you help her find what she needs and then clean up, so that together you can have a fun creative time sewing the little princess a gorgeous dress?